Owner Lee Michaels Dreams of Twin Spires with Texas Red: Imagine holding a chance to reach the Kentucky Derby as a first time racehorse owner, or winning a Breeders’ Cup race with no prior tries! Some people wish for just one horse good enough to compete against the best, let alone win a prestigious graded stakes event. Lee Michaels first met Texas Red at Mayberry Farm in Ocala. 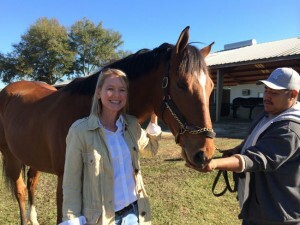 Retired attorney and Dallas community volunteer Lee Michaels currently lives a dream with her first racehorse, Texas Red. Ironically, she almost passed on the opportunity to join the group that owns Texas Red. 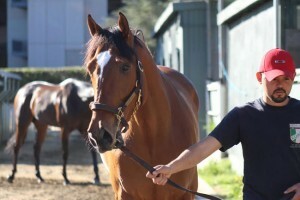 But on Sunday, Michaels officially becomes a participant on the Derby trail as Texas Red launches his 2015 campaign in the seven furlong G2 San Vicente at Santa Anita Park under the guidance of trainer Keith Desormeaux and jockey Kent Desormeaux. The racetrack expects seven other three-year-old horses to compete against ‘Red. To arrive at this point, years ago Michaels met Janet Brehm, the wife of previously interviewed co-owner Eric Brehm, when Michaels’ daughters attended Mrs. Brehm’s kindergarten class. The two became friends, and when Erich bought the Afleet Alex sired Texas Red, the excited owner offered Michaels a chance to purchase a partnership interest. With her focus on helping the youngest daughter apply to colleges, however, she turned down the proposal. Instead, Paul Michaels decided to surprise Lee and bought the interest for his wife. Lee Michaels pays Texas Red a visit after his 3rd place finish in the G1 FrontRunner Stakes at Santa Anita Park. Although Lee never owned a horse before, the passion persisted throughout the years. As a girl, she lived in Lexington, KY and took riding lessons. Even when the family moved, she continued riding in Lexington and hoped to own a horse one day. Texas Red’s early success came as a surprise for the new owner. “(I) just didn’t expect that the first horse I owned would be a Breeders Cup champion!” exclaimed Michaels. 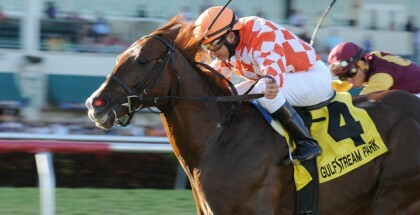 Considering Texas Red’s fast start, her next horse’s accomplishments might turn out underwhelming. Texas Red owns two wins, one second and a third, with his second win coming in the G1 Breeders’ Cup Juvenile. 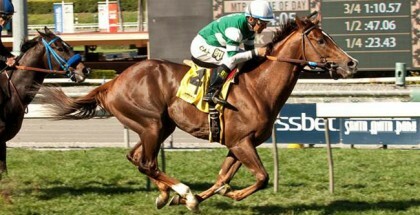 His lifetime earnings currently stand at $1,192,300, quite an achievement for a young horse. For Texas Red’s name, Lee gathered inspiration from another past successful colt and eventual legendary racehorse. 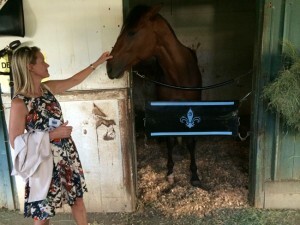 As for what quirks Texas Red shows around the barn, Michaels needed help from Desormeaux’s assistant Julie Clark, who noted that Texas Red tends to rear up in a playful manner (and, in the process, gives everyone a heart attack). He acts as a proud horse, even carrying part of his lead shank in his teeth to lead himself while cooling out. One creature though causes an unusual reaction in Texas Red: pigeons. Texas Red enjoys a carrot from the stylish Lee Michaels after winning the 2014 Sentient Jet Breeders’ Cup Juvenile. Because of her location in Texas, and Texas Red’s homebase in California, Michaels cannot come to the barn often. After the Breeders’ Cup though, Michaels visited Texas Red in his stall and observed how the talented colt likes to sleep after a big win. 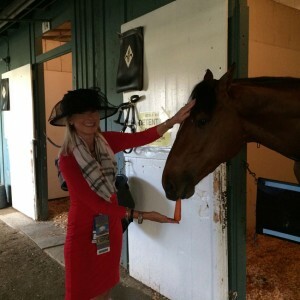 “It was a little challenging to get his attention a couple days after the Breeders Cup since he was snoozing away — dreaming of the twin spires perhaps?” she wondered. When Michaels does attend Texas Red’s races, she enjoys spending time with her WOTR (Women of Texas Red) girlfriends, who are also the significant others of Red’s other owners. Together they discuss fashion ideas for the big race days. Since the men in the group seem less inclined to talk fashion, WOTR fills this fun gap in her ownership experience. Michaels even put positive fashion spin on the outcome of the recent Eclipse Awards, as their horse lost the two-year-old Eclipse against Zayat Stables’ American Pharoah. ” … we were honored to be there and it was a fun weekend, and a great chance to wear our favorite color, red” she remarked. Texas Red acts as a proud horse, even carrying part of his lead shank in his teeth to lead himself while cooling out. Expect to see Michaels in attendance at Santa Anita this weekend. Though not a heavy bettor, she always places a bet on Texas Red when attending his races. 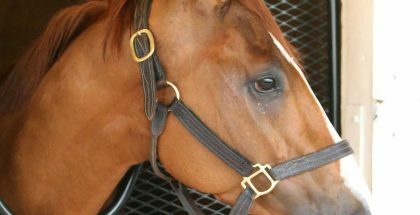 Should the colt continue to progress, perhaps Michaels can wager on her horse at historic Churchill Downs the first Saturday in May, with everyone watching. The feeling of attending the country’s most famous race in person, while running a horse in that race and directly participating in the festivities, is something the new owner looks forward to as spring rolls along. “It will definitely be memorable if my first time (at the Derby) is as an owner,” Michaels confessed. How will she pass the time until May? One task comes to mind. Follow Team Texas Red down the Derby Trail on twitter and official facebook page. 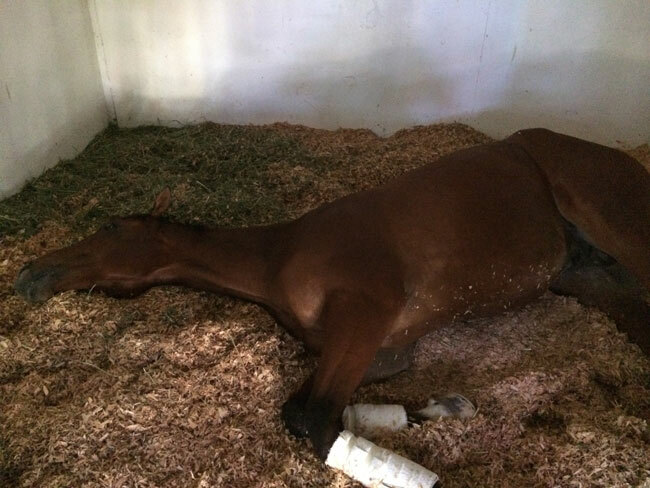 Texas Red takes a long nap after his victorious 2014 Breeders’ Cup Juvenile romp. Dreaming of the Churchill Downs Twin Spires perhaps?